More Than a Tree is Growing in Brooklyn! 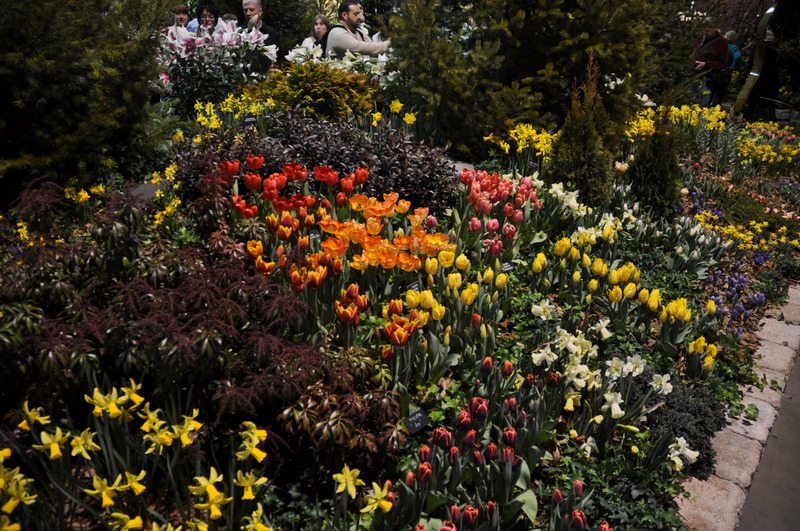 Celebrate spring with a trip to the Brooklyn Botanic Garden and Brooklyn Museum! The Pennsylvania Horticultural Society is hosting a trip on Wednesday, May 23 from 8 am to 6 pm, and the fee ($110 for members, $120 for non-members) includes bus travel, entrance and tour fees, and snacks and wine. The Brooklyn Botanic Garden contains 52 acres of specialty garden areas, plant collections, and conservatories with more than 10,000 taxa of plants. The world-class collections and gardens include cherry trees, a Japanese hill and pond garden, a Shakespeare garden, and more. The Steinhardt Conservatory houses one of the oldest Bonsai collections in the country, as well as aquatic house, tropicals, orchids, and a desert collection. The Brooklyn Museum, adjacent to the Botanic Garden, is the home of the collection left by Laura Barnes, the wife of Dr. Albert Barnes and founder of the horticulture program at the Arboretum of the Barnes Foundation. The Museum has amassed one of the largest and most diverse collections in the United States, ranging from the ancient to the contemporary and encompass virtually all the world’s principal cultures. Limited to 36 participants, this day in Brooklyn promises to be a springtime delight. Click here to register, or contact Carol Dutill for more information. While we’re still basking in the Flower Show afterglow, we want to take a moment to thank our sponsors, some of which had exhibits at this year’s Show. Each one was a crowd-pleaser, and we look forward to what they bring next year. Vastly different but equally enjoyable was the EP Henry exhibit, which celebrated family vacations by building a tropical Hawaiian retreat. Surrounded by soaring palms and tropical gardens, a cabana served as the party hub with its built-in grill and bar made from a surfboard. Environmentally friendly Eco Pavers formed a patio for lounging, and the plunge pool was the perfect spot for taking a dip. The tableau was completed with a wading pool, secluded outdoor shower, and an al fresco dining area. Now that you’ve seen what EP Henry can do inside the Convention Center, imagine the possibilities for your own property. Across a walkway from EP Henry, Subaru created “The Surf Shack,” a fun getaway where you can rent a board, ride the waves, and soak up the sun! 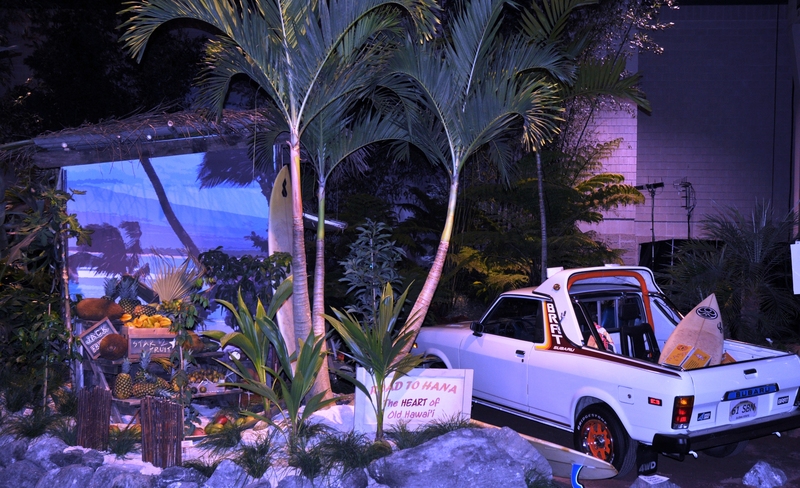 The display invited viewers to imagine being transported to a little piece of paradise in a Subaru Outback. With a jaunty thatched-roof hut and plenty of tropical fruits for snacking, this little slice of the islands was all about fun. There were at least five Subarus throughout the Show; some were fun, vintage varieties, others were impressive new models. 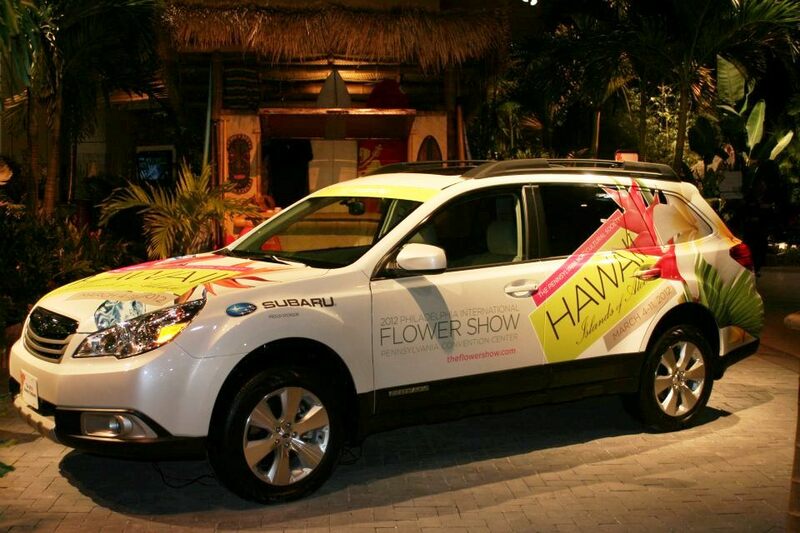 Subaru loves gardeners and gardeners love Subaru, so the Flower Show partnership for the past 11 years has been a perfect match! 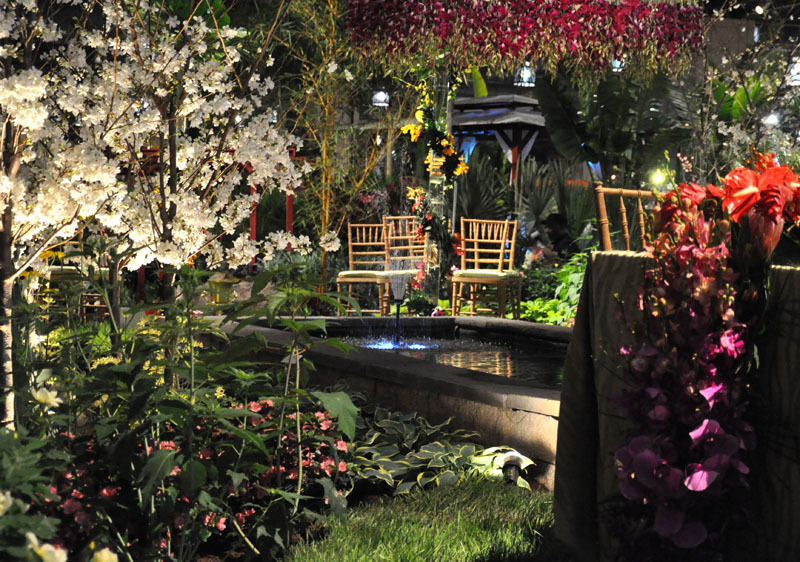 Thank you to all the Flower Show sponsors who made 2012 such a spectacular year! 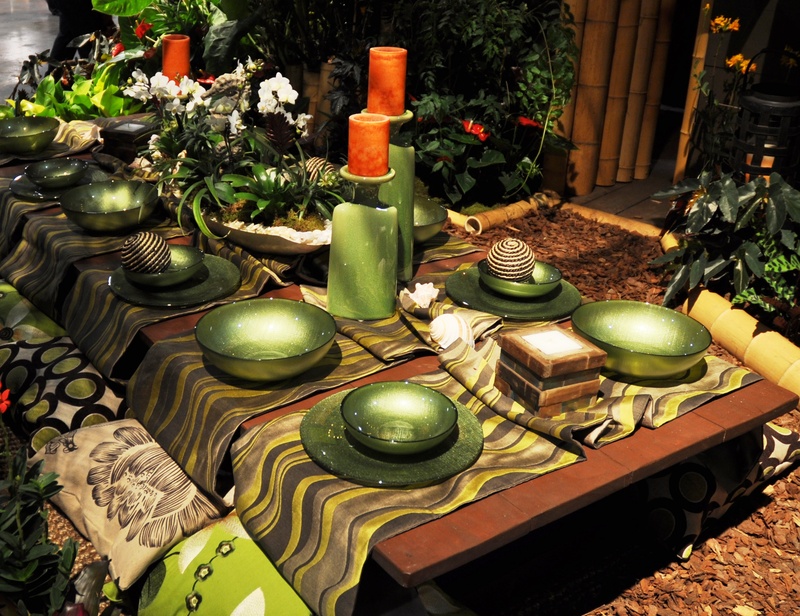 For their debut display the group wanted to take the traditional luau and turn it up a notch. So, they did their research on Hawaiian culture, and came up with a brilliant idea! The exhibit is called Pineapple Pa’ina, and celebrates the fleeting nature of the night before a wedding, when the lucky couple and their two families and closest friends gather together to feast and celebrate. The display is striking with it’s extravagantly adored table and larger-than-life pineapples, which we learned are made of 800 carnations! Like all of our exhibitors, each night they refreshed the exhibit, which is an intense process, but all that hard work is worth it when you make such a strong first impression. Come back again next year! 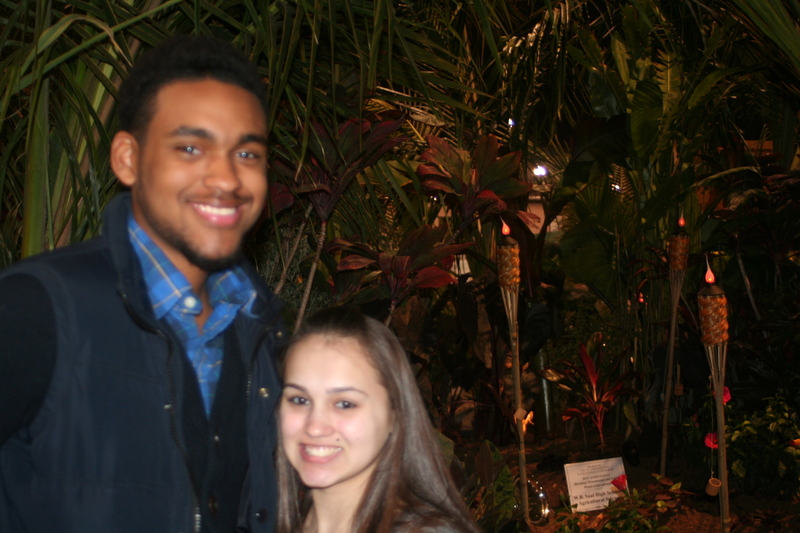 Today is closing day of the Flower Show, and we can’t help but get a little misty-eyed. As always the exhibitors have done an outstanding job creating memorable displays with compelling stories. Take, for instance, perennial favorite Stoney Bank Nurseries. It is easy to get caught up in the story Jack Blandy and company tell with their display! Picture this: you are driving down the highway in Maui, looking out the window at the tropical scenery. Taro crops appear in flooded fields as the road ahead lazily snakes into the distance. Just another afternoon. But wait! You’re not in Maui, you’re in Philly! How do they do it? The depth in the Stoney Bank Nurseries exhibit is an optical illusion created by clever backdrops, props, and plant positioning. Exhibitors have a limited space and over-sized ideas, so they have to get creative! 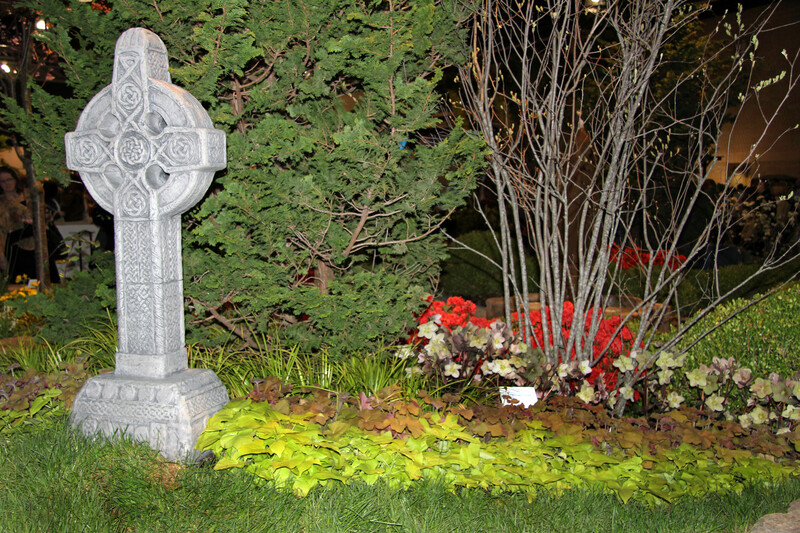 The Men’s Garden Club of Philadelphia also succeed in storytelling. And considering it’s their twenty-third year exhibiting, that shouldn’t come as a surprise. Their interpretation of this year’s theme is especially fun; they depicted a coffee plantation in the midst of celebrating a victory at a coffee festival! John Young, the vice president of the Men’s Garden Club of Philadelphia, pointed out the beautiful triangle palm tree in the corner of the exhibit, a rare specimen with a distinctly triangular trunk, which is how this beautiful palm gets its name. What stories will these exhibitors cook up for 2013? Who know, but we’re sure they will be brilliant! Please join the Flower Show in welcoming two new exhibitors who showcase ways to build healthy soil, strong plants, and vibrant communities. America in Bloom shows how tropicals can pack a visual wallop in a small space, adding zing to the urban landscape. Even in an island paradise like Hawaii, great communities don’t just happen. It takes a great deal of thought and tender loving care to create a sense of place. There’s no better way to communicate life and vitality than through beautiful plantings. That’s why more landscape architects are creating the “wow” factor by placing bold tropical foliage in urban settings, even in northern climates. Colorful annuals communicate color at eye level in hanging baskets and planters. The backdrop may be green and serene or gray concrete, but color commands attention. America in Bloom brings communities to life by demonstrating the social and economic benefits of plants. There is an underground revolution spreading in how we maintain our landscapes. 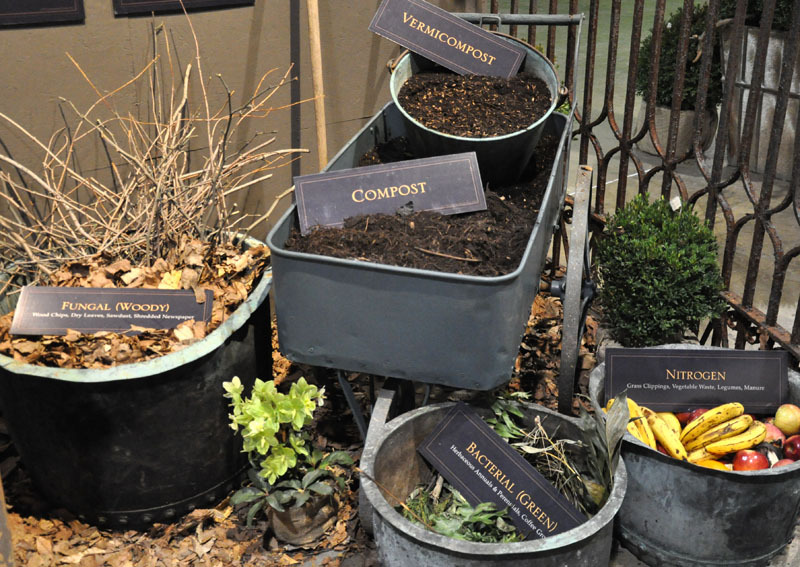 It is occurring in the soil and it involves bacteria, fungi, microbes, and roots, which are now encouraged by compost and liquid biological amendments, rather than vast amounts of high-nitrogen fertilizers and pesticides. F2 Environmental Design’s landscape design and management techniques focus on encouraging the natural nutrient cycling systems and growth patterns of the plant environment. 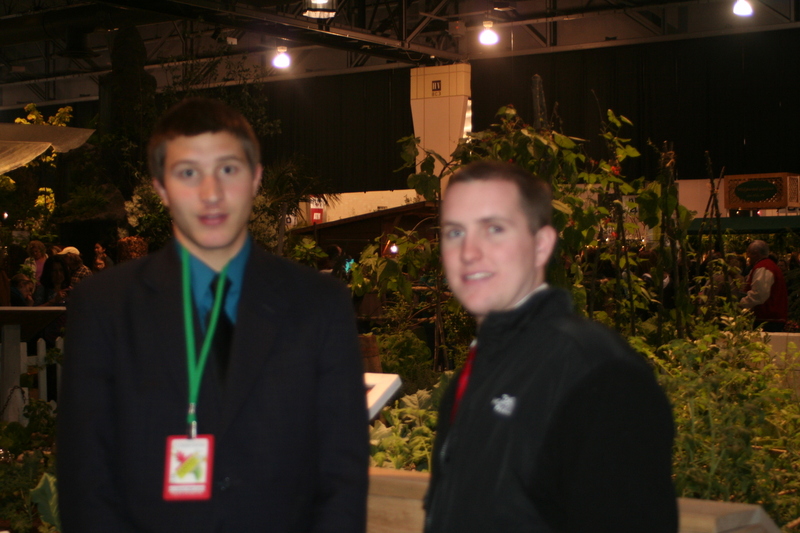 Hey, Flower Show fans. How about a quick poetry break? Nice, right? 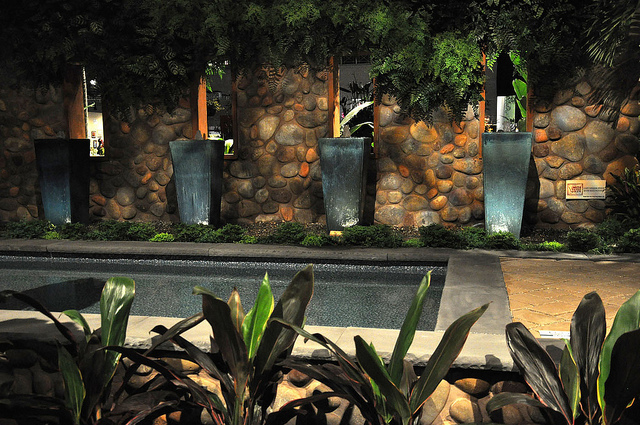 It certainly sets the tone for the tropical retreat created by Mark Cook Landscape Design (and it was written by his wife). Approaching this exhibit feels like stepping from the water, onto the sand, and into an intimate setting. Surrounded by many plant varieties, you can retreat down a boardwalk to a hidden pergola buried in the tropical forest. This pergola has elicited oohs and aahs from Flower Show visitors and proves that Mark is equally handy with saws and hammers as he is clippers and shovels. If you attended the 2011 Show, you may remember the charming yellow shed he built to support the Parisian theme, or the year before when he made a rustic clubhouse with all sorts of off-kilter angles. Catch the tail end of the breeze and enjoy the exquisite details of Mark Cook’s exhibit. 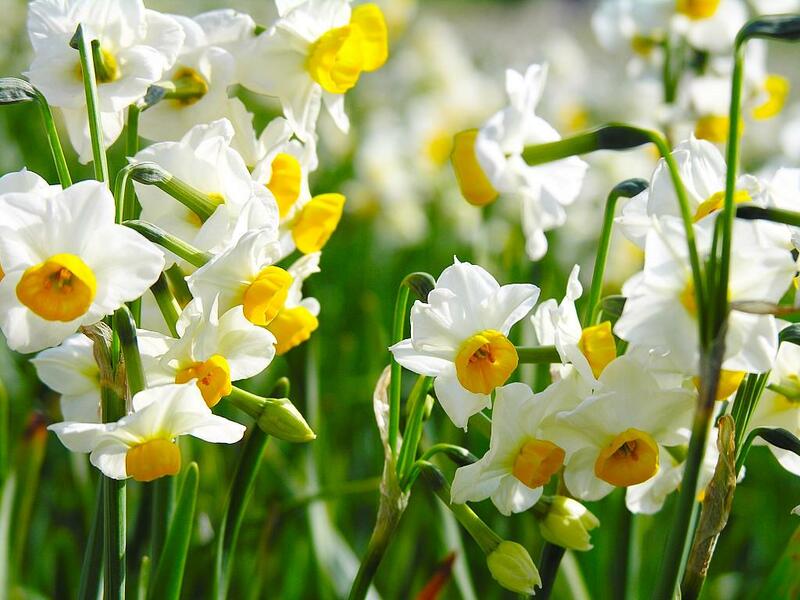 Catch the tail end of the Flower Show today, 8 am – 6 pm. The list of exhibitors at the Flower Show reads like a “Who’s Who” of the horticulture industry, and includes some of the area’s finest landscape architects and installers, as well as respected floral designers. Every visitor has a favorite, and here are two that exemplify the differences. The exhibit created by award-winning Michael Bruce Florist is a whimsical compilation of three sand-filled islands, connected by pass-through arches of gently manipulated bamboo. Individual cut blooms have been draped like jeweled necklaces from carefully woven and suspended mats, interspersed with sparkling capiz shell medallions. 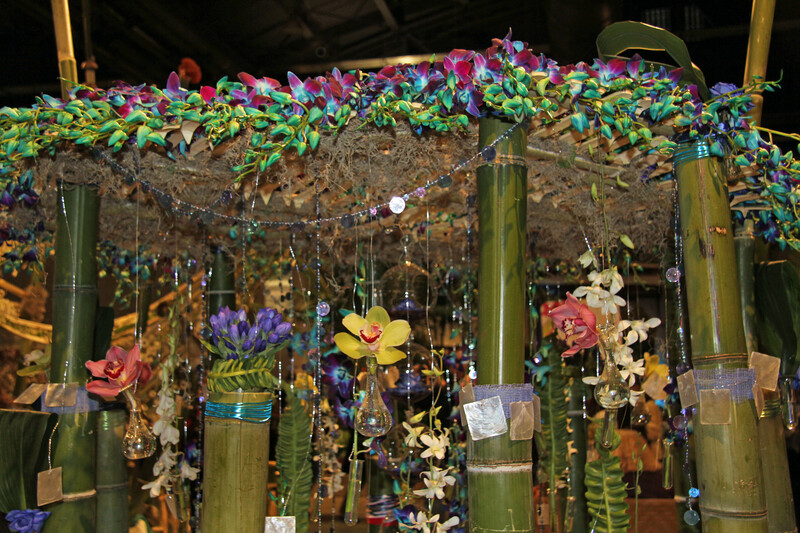 Brightly colored orchids are the stars of this show, placed in tear drop-shaped vials that hang at eye level. Truly a display that’s not to be missed. 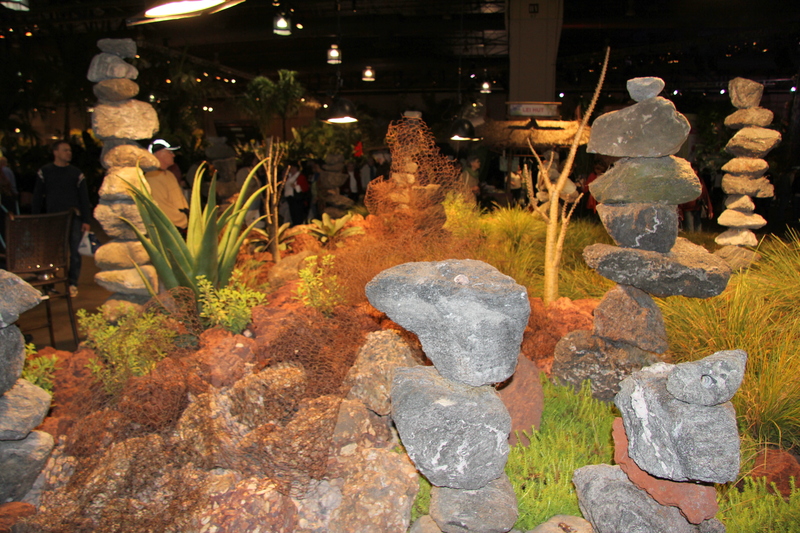 In the Michael Petrie’s Handmade Gardens display, gravity-defying stacks of lava rock punctuate this fantasy landscape inspired by the wind-carved stone formations and lunar-like landscape of the Garden of the Gods (Keahiakawelo). Legend has it that ancient Hawaiian gods created the high-desert area on the island of Lanai by dropping boulders from the sky. Winner of the “Showcase Garden Award,” the “”Mayor’s Trophy,” and “Best Achievement Blending Horticulture, Landscape, and Artistic Elements,” this display continues to wow visitors with its size, scale, and story. Whether you want to appreciate a single, cut blossom or be enlightened by landscape possibilities, the Flower Show has inspirational moments for everyone! have created a misty mountain where ferns cling and shade-loving Taro plants thrive! Their exhibit is called Aloha Aina: A Return to Life with the Land, and it is a striking interpretation of the Hawaii theme. You can listen to a podcast about how the students conceived, designed, and built their exhibit by clicking here. Students from the Delaware Valley College, Department of Natural Resources and Bio-systems Management invite you to venture underneath a mountain stream to see a world teeming with life! Their exhibit is titled World Beneath Our Feet, and it reminds visitors to reflect upon the necessity of these often unseen systems of plants, animals and soils to sustain life. The students at Williamson Free School of Mechanical Trades worked hand-in-hand with experts from Colonial Williamsburg to create a garden called American Roots: A Williamsburg Colonial Kitchen Garden. 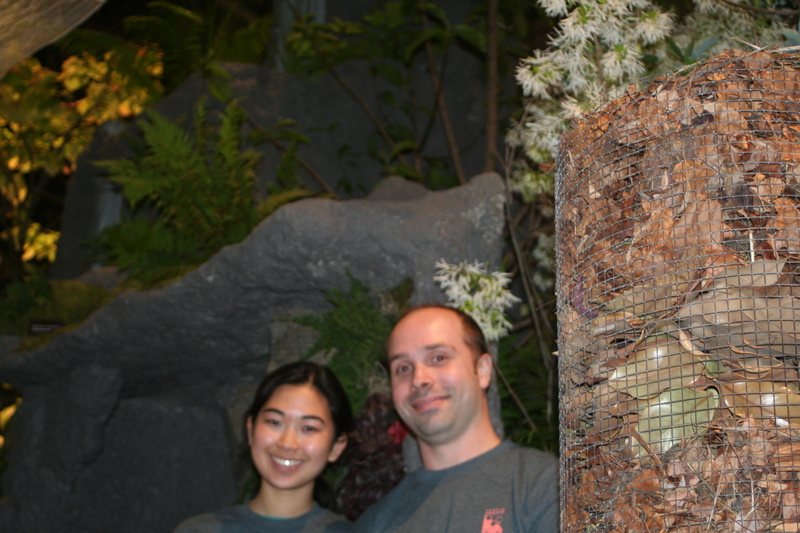 The exhibit has heirloom vegetables, espalier fruit trees, and an herb garden—all enclosed in a rustic wood fence. Stop to admire the era-appropriate tools in this well-researched display. W.B Saul High School of Agricultural Sciences students take an interesting approach to this year’s theme by reminding visitors that today’s Hawaiian paradise began with the arrival of plants brought from Polynesian islands. Their exhibit is called “Ka Māla: The Canoe Garden” because it prominently features a student-made canoe representing the canoes full of tropical plants that were originally brought to Hawaii from the Polynesian islands. Three courses at the school collaborated for this ambitious project. The Horticulture Academy at Abraham Lincoln High School has created an exhibit that highlights green walls and their utility in public transportation. 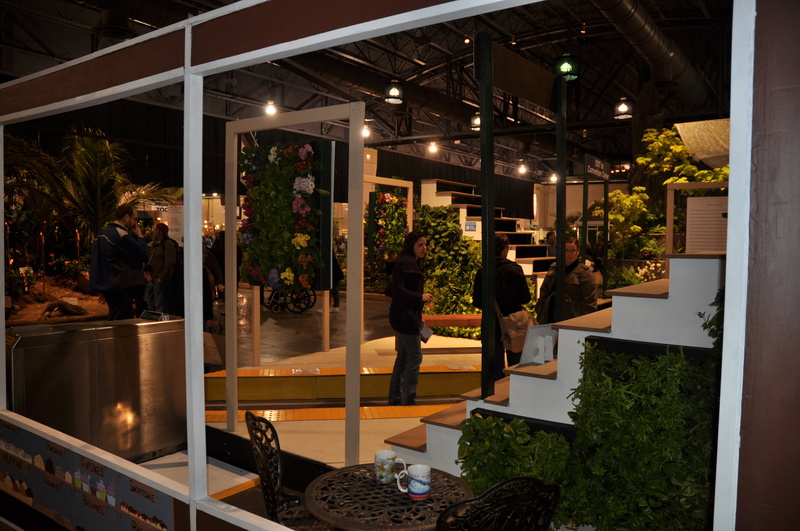 Titled On the Right Track: Going Vertical, the exhibit features a SEPTA station decked out with green walls (also called living walls, eco-walls or vertical gardens). We applaud the efforts of these students! Great work! …and they’re here to help us to build a cleaner, greener city, celebrate splendid gardens, and sustain our native wildlife. Let’s take a look at three important agencies and the work they do. Picture Philadelphia's City Hall surrounded by new green plantings, completing a green belt stretching a mile and a half up Benjamin Franklin Parkway to the Philadelphia Museum of Art. Photo from set-up week. The Philadelphia Water Department challenges us to walk through Center City and re-think the cityscape using models of iconic buildings and whimsical succulent plantings representing parks, trees, and green roofs. Kids love the skyscrapers that are only a bit bigger than they are, and grownups appreciate the interpretive signage. Learn how a greener city will not only please the eye, but help to purify our air and water. Imagine an event catered by Stephen Starr on a green lawn with a vista of reflecting pools and sunken gardens. That's Fairmount Park! Philadelphia has the country’s largest municipal landscaped park—Fairmount Park. 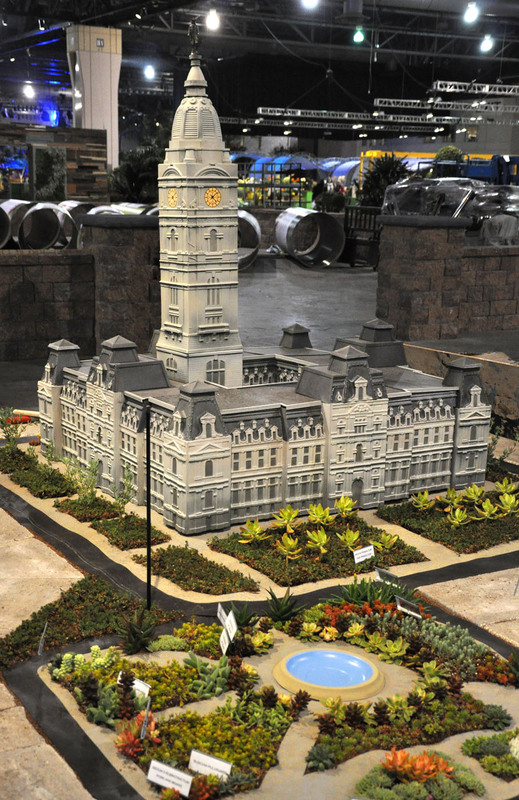 For the 2012 Show, Philadelphia Parks & Recreation has recreating its gardens outside the Horticultural Center in the Centennial District, just a five-minute walk from the Please Touch Museum. 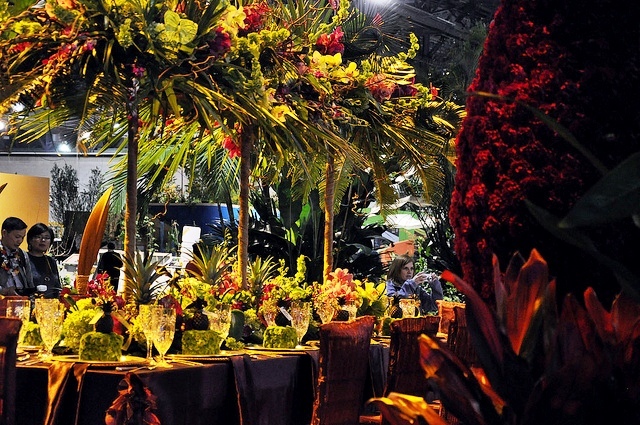 The real gardens provide the perfect backdrop for a garden wedding or other event—and with culinary superstar Stephen Starr as the resident caterer, the food and drink are sure to please. 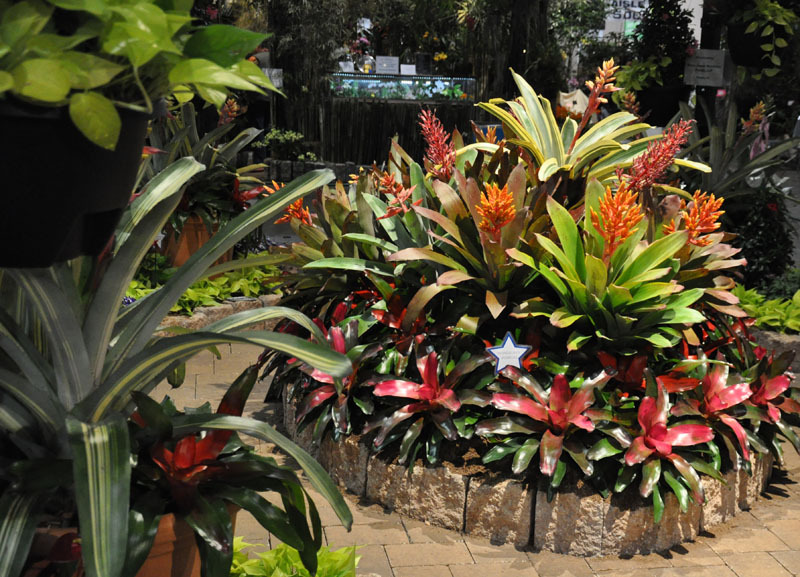 In order to create this exhibit, the Horticultural Center staff forced many of the plants in their greenhouses before turning their attention to their spring and summer plans. Be sure to visit Fairmount Park as soon as the weather warms! 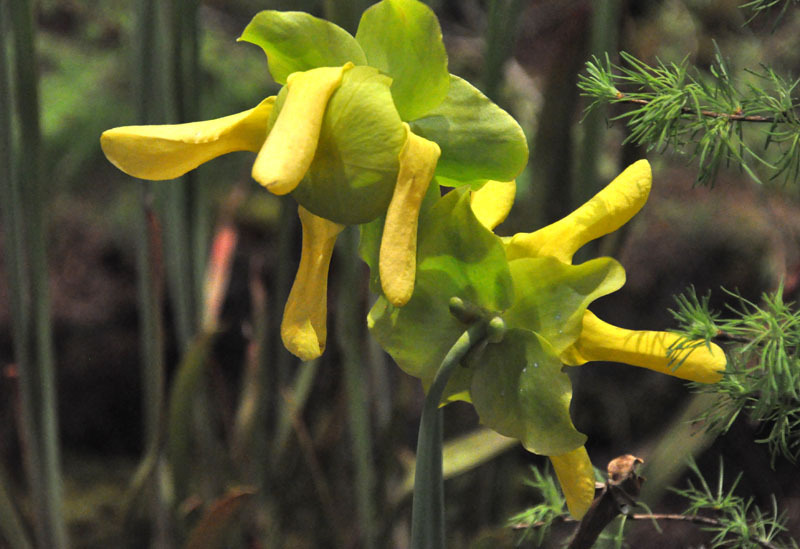 Sarracenia flava, yellow pitcher. One of our region's native wetlands plants, on display at the EPA exhibit. The U.S. Department of Environmental Protection (Region III) invites us to set up camp along a native woodland paradise and listen to the tranquil sounds of a cascading brook as it emerges to form wetlands. This exhibit is a labor of love for EPA staffers who grow many of the plants themselves to stretch their exhibit budget. 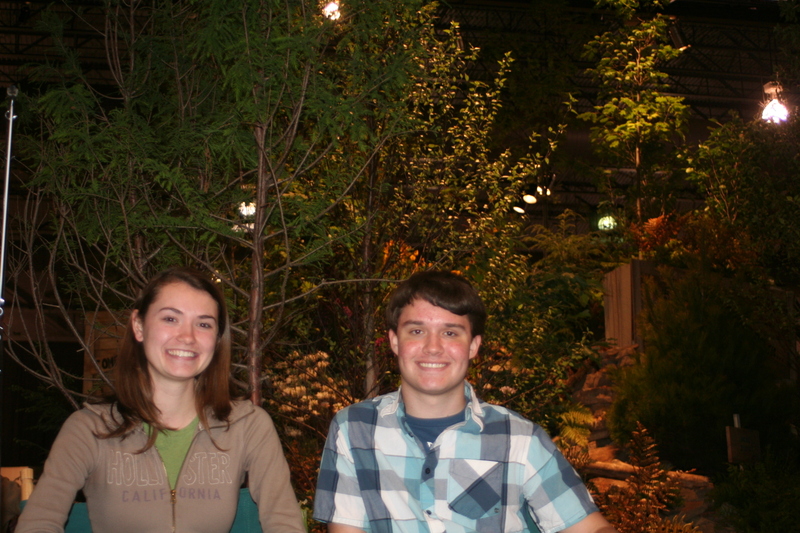 There’s a lot to learn at the Flower Show—in addition to these three, there are exhibits from more than a dozen schools and plant societies. Make sure you budget ample time to see all they have to offer.